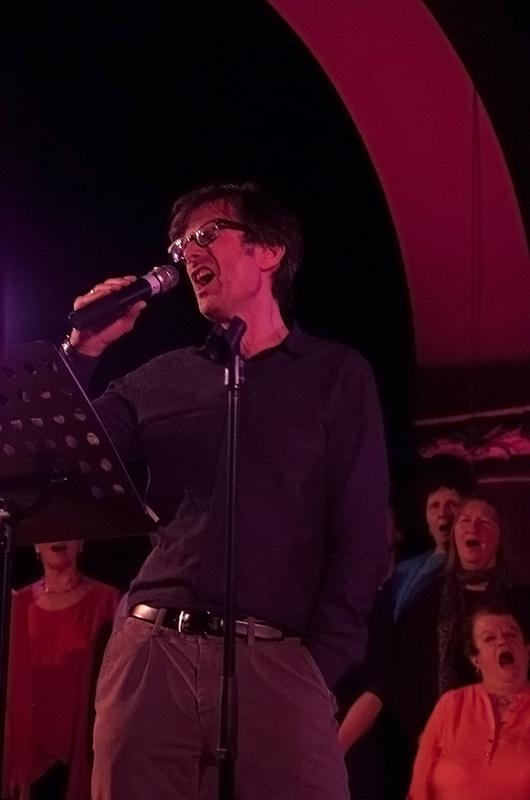 Robert Peston Sings Bohemian Rhapsody in St Barnabas Church with Jericho Singers! 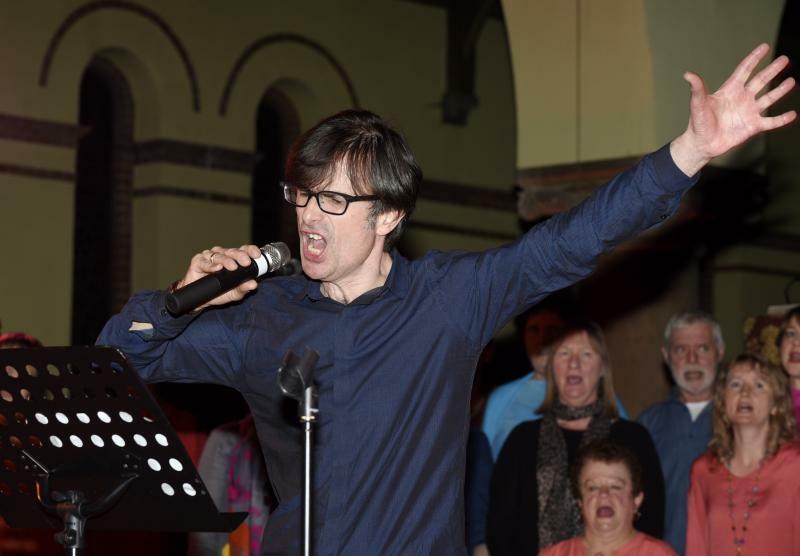 It’s not often that a clever, renowned, mild-mannered economics editor pops by for a quick sing of Bohemian Rhapsody in the beautiful St Barnabas Church, Jericho. A couple of years back the Radio 4 PM programme asked listeners to write in with suggestions for challenges that Robert Peston could do as he likes trying new things. 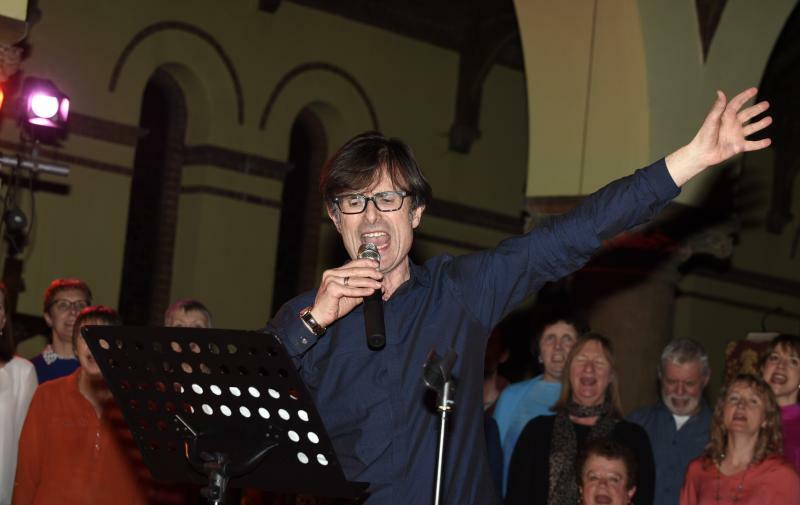 One of our choir members, Sarah Wood, suggested that Robert should have the experience of singing one of pop’s most loved anthems, Queen’s Bohemian Rhapsody with us all. This was one of the challenges that were chosen. You can hear the radio 4 clip here. Sarah is a committed member of our choir and was inspired by our tour to Italy in June 2015 to believe that we we were up for the challenge, and she thought Robert would be too. When Robert left the BBC to join ITV and we thought that was that. So Sarah, and in fact the rest of us, were quite surprised, though delighted, when, about two years later, to find out that the gig was back on. But how? With a love of singing and a good spirit Robert agreed to fulfill his promise to sing with us. He was coming to Oxford for a talk organised by Jacqui Ibbotson from with Tim Harford at Oxford University’s new Blavatnik School of Government in Jericho and the opportunity was too good to miss. 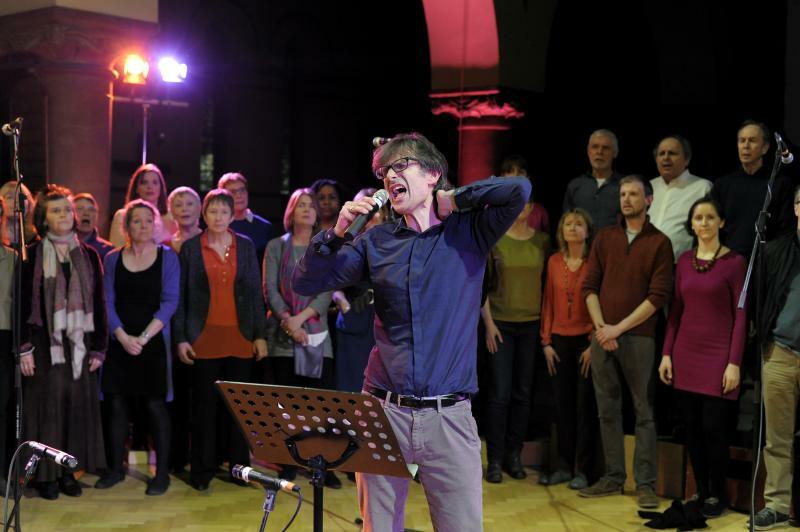 The choir practiced hard and we recruited an ace band of Al Pirrie on bass, Keith Fairburn on drums, Martin Pickett on piano and Brian May non-look-a-like but much sound-a-like Ben Avison. On the day, Robert arrived for a bit of lunch and a wee practice, followed by more rehearsing with the band and most of the choir. This was a lot of fun in itself, never mind the show later. Robert really threw himself into the performance! The performance was part of a lovely concert ‘Roses and Castles, created by Steph Pirrie and Charlie Henry to celebrate life in and around the Oxford canal. A celebration of history, stories, music and sounds. Our final performance was a triumph, Robert must have been nervous and exhausted, but if he was, none of this showed. He absolutely went for it and threw himself into the song. Freddie would have approved. We hope he will come back for a re-match soon and that he enjoyed it as much as all of us! He certainly looked as if he did! A big thank you all our friends and community folk who came down to support us. It was a memorable and wonderful evening.